John’s post got me thinking about my lake experience last month. While out water skiing, I noticed that when I cut my slalom ski, the spray behind my ski was making a rainbow in the noonday sun. So I decided to have some fun with God as based on his covenant with Noah. 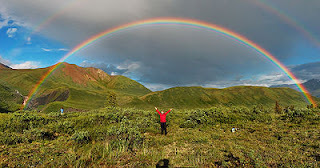 According to Genesis 9, God uses all rainbows throughout the world like a string tied around his figure to remind him: “Hey, you don’t need to use water again to destroy humanity!” (How quickly God keeps forgetting about the million he destroyed)! As I cut my ski, talking to myself I said, “God, show me your covenant with Noah.” God did! As I cut a second time, sending up a spray rainbow, “I said, “God, show me your covenant with Satan.” God did! Third cut spray, “I said, “Satan, show me your covenant with God.” Satan did! Fourth cut spray, “I said, “Buddha, show me your covenant with Noah.” Buddha did! Fifth cut spray, I said, “Show me a sign you don’t exist and the Bible is a lie via a rainbow. Damn, God does answer prayers, as he did! More to the point, when it comes to the thousands killed in a tsunami, what difference does it make (apologetically) to the person (be it a Bible Believer or not) dying in a flood if the promise / covenant with Noah was about a worldwide flood? Rainbow or not, their asses are drowned! Finally, if science wants to know about Global Warming flooding the major coastal cities . . . Screw it! Just look at the rainbow!